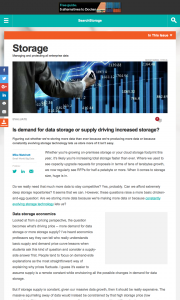 Is demand for data storage or supply driving increased storage? An IT industry analyst article published by SearchStorage. Figuring out whether we’re storing more data than ever because we’re producing more data or because constantly evolving storage technology lets us store more of it isn’t easy. Whether you’re growing on-premises storage or your cloud storage footprint this year, it’s likely you’re increasing total storage faster than ever. Where we used to see capacity upgrade requests for proposals in terms of tens of terabytes growth, we now regularly see RFPs for half a petabyte or more. When it comes to storage size, huge is in. Do we really need that much more data to stay competitive? Yes, probably. Can we afford extremely deep storage repositories? It seems that we can. However, these questions raise a more basic chicken-and-egg question: Are we storing more data because we’re making more data or because constantly evolving storage technology lets us? 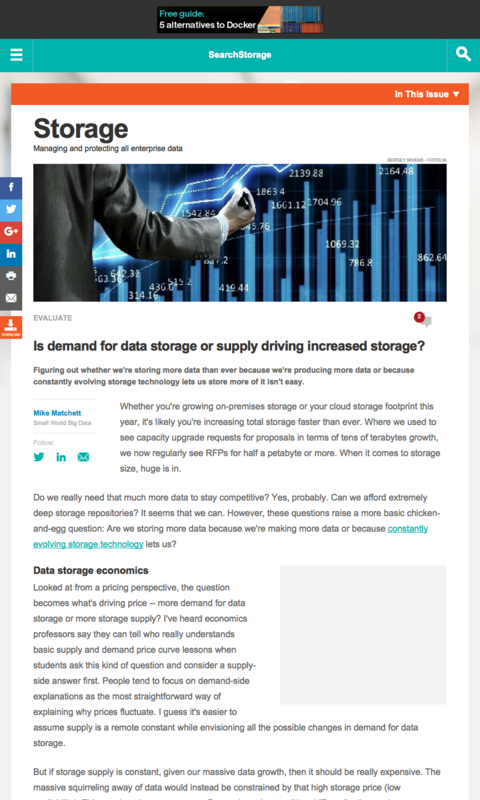 Looked at from a pricing perspective, the question becomes what’s driving price — more demand for data storage or more storage supply? I’ve heard economics professors say they can tell who really understands basic supply and demand price curve lessons when students ask this kind of question and consider a supply-side answer first. People tend to focus on demand-side explanations as the most straightforward way of explaining why prices fluctuate. I guess it’s easier to assume supply is a remote constant while envisioning all the possible changes in demand for data storage. As we learn to wring more value out of our data, we want to both make and store more data. But if storage supply is constant, given our massive data growth, then it should be really expensive. The massive squirreling away of data would instead be constrained by that high storage price (low availability). This was how it was years ago. Remember when traditional IT application environments struggled to fit into limited storage infrastructure that was already stretched thin to meet ever-growing demand? Today, data capacities are growing large fast, and yet the price of storage keeps dropping (per unit of storage capacity). There’s no doubt supply is rising faster than demand for data storage. Technologies that bring tremendous supply-side benefits, such as the inherent efficiencies in shared cloud storage — and Moore’s law and clustered open source file systems like Hadoop Distributed File System and other technologies — have made bulk storage capacity so affordable that despite massive growth in demand for data storage, the price of storage continues to drop. When we think of hot new storage technologies, we tend to focus on primary storage advances such as flash and nonvolatile memory express. All so-called secondary storage comes, well, second. It’s true the relative value of a gigabyte of primary storage has greatly increased. Just compare the ROI of buying a whole bunch of dedicated, short-stroked HDDs as we did in the past to investing in a modicum of today’s fully deduped, automatically tiered and workload-shared flash. It’s also worth thinking about flash storage in terms of impact on capacity, not just performance. If flash storage can serve a workload in one-tenth the time, it can also serve 10 similar workloads in the same time, providing an effective 10-times capacity boost. This entry was posted in Published Articles and tagged big data, Data growth, economics, Flash, SearchStorage, secondary storage, Storage by Mike. Bookmark the permalink.